Are you ready for the CPE exam? The CPE (Certificate of Proficiency of English) exam is considered to be a test for those who have a very advanced level of English. It is one of the most difficult tests given by the University of Cambridge. Are you ready to take the CPE exam? Take this simple questionnaire to find out. Are you able to understand over 3000 words of text in books, magazines and newspapers? Is your English level high enough to complete missing parts of large texts? Can you read and retain information from long English texts? Are you able to write detailed articles in English about any topic? Do you know what a lead-in sentence is, and how to use them to extract information? Can you listing to and understand audios of different lengths and speeds? Are you confident you can speak extensively with an interlocutor? If you answered 'no' to any of those questions, you may want to speak with one of Live Lingua's CPE tutors. The first trial CPE class is absolutely free. You can speak with the tutor to see if they think you are ready for the CPE test and they can propose a study plan for you. No credit card required, and no commitment. 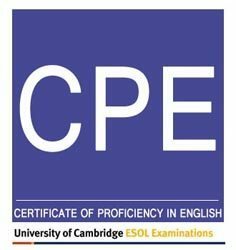 The CPE (Certificate of Proficiency of English) exam is the most advanced English certificate offered by the University of Cambridge. They strongly recommend that all candidates for this certificate study extensively before attempting to take this exam. The exam takes a total of over 6 hours - with breaks - and can be very stressful and exhausting for candidates who take it without proper preparation. The CPE Exam has the following sections. Do you have any questions about the CPE (Certificate of Proficiency in English) exam? You can speak to one of our CPE tutors for free to ask any question you may have. They will speak with you and evaluate how prepared you are. Speak To A CPE Tutor Today! What makes Live Lingua CPE tutoring different from the local tutors or enrolling at a local language school? And best of all, we let you meet and speak to your future CPE teacher before having to commit to paid classes! The more CPE lessons you enroll in at the same time, the cheaper the hour of class gets. Still not sure if Live Lingua CPE tutoring is the right choice for you? Then just try a free lesson with one of our tutors to make sure. No risk, no commitment. "The English course has been great for me. I started with just the course, and then signed up for some classes. It is just what I was looking for, I highly recommend Live Lingua"
"The best part about the exercises is that they are online and I can use them when I want. I work strange hours and this is ideal for me." "I scored a 7.5 on my IELTS exam. Thank you so much!"